It takes 25 minutes to drive from our house to Isaac's weekly physical therapy appointment. "The Boys Are Back," the first track on the High School Musical 3 soundtrack, is 3:45. I'm not so good at math, but if my calculations are right, Isaac and I listened to the song a little more than 13 times in the car this morning. 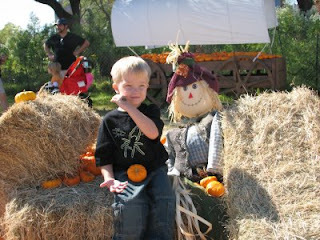 The upside is that he now knows all the words, and some pretty cool dance moves he picked up from his mom. The downside is that I looked like a dork dancing while driving a minivan, and the song is irrevocably stuck in my brain. Last week my mom, my godmother and I attended a lecture at Central Market given by Jack Bishop, editor of America's Test Kitchens and Cooks Illustrated. The lecture was great, and we went home with signed copies of their new cookbook, but I must admit that I was kind of wary. I've always been more of a Rachael Ray in the kitchen than a bow-tied Christopher Kimball, and the few times I watched the show on PBS I always felt so overwhelmed by all of the rules I'd have to follow to make a recipe perfect. I'm much better at tossing in a little of this and a little of that and praying it isn't disgusting. A child of the modern era, I'd never really understood the phrase "dishpan hands." About two weeks ago, our dishwasher broke. The new one that we bought less than two years ago. Eddie spent a night under the sink, cleaning out tubes and pipes, and we thought we were in the clear, but apparently blockages aren't our problem. What is? Not sure, but I have a feeling it's going to be expensive. As I mentioned at fMh a week or so ago, it was during our dishwasher surgery that we discovered the demise of the oven. It got really, really hot, and then the bottom coil went kaput. 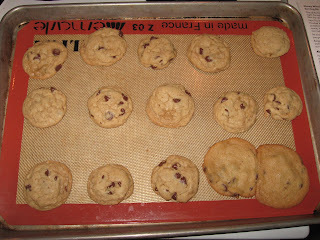 While I had chocolate chip cookies in the oven. Eddie, unsuccessful at dishwasher surgery, decided to try his hand at fixing the oven. So we looked up the parts online, and while we were already at the parts replacement website, decided to order a new handle for our microwave, which has been broken for at least a year. In order to determine exactly which part we needed, we had to take the whole dang thing apart. But Eddie eventually ordered an oven coil and a microwave handle. So if you're following along, we were down a dishwasher, an oven and a microwave, leaving us with only the stovetop and the refrigerator. No nuking chicken nuggets, no tiers of sparkling clean dishes awaiting me in the morning, no homemade baked goods. My mom, visiting at the time, approached our lack of major appliances as a culinary challenge. One night she whipped up an Asian stir fry, potstickers and a salad with wilted greens and sweet potatoes. I, on the other hand, know that if we cook we have even more dishes, and rather than subject my hands to further abuse, decided to eat out until all three problems were solved. Eddie fixed both the oven and the microwave last night, leaving me with the task of calling someone about the dishwasher. I haven't done it yet. Yeah, having a broken dishwasher is a major pain, but so is trying to put dinner on the table while supervising homework and keeping Maren from watching yet another episode of Dora. As long as the option of eating out is still on the table, I think I'm going to exercise it. Sorry, I know the blog is looking a little funky right now. Please bear with me as I try to make it look better. I'm sort of technically challenged, so it might take a while. 2. kids whose piano practice actually sounds like music! Bryce-- a Star Wars guy for the third year running. 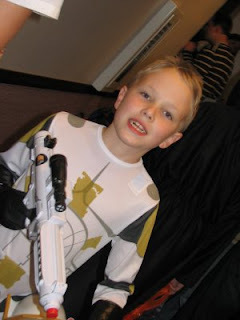 This time he's a Clone Trooper. Annie has been very eager to jump-start her racing career so she can catch up to her Mommy! 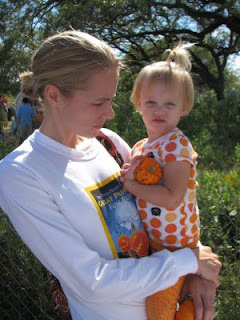 She raced her first 3K on Saturday, when Texas Heart Institute sponsored its Great Pumpkin Fun Run. And crossed the finish line 45 minutes later! Isaac was a very patient racer. Maren, not so much. Maybe I'll have a running partner sometime in the not-so-distant future! 3. No oven=no expectation to cook! 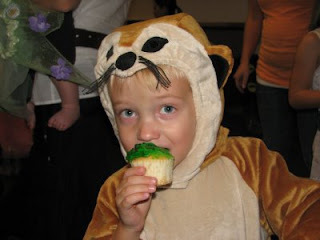 I'd be remiss if I didn't note that a year ago last week, Isaac was in the hospital with MRSA. Lots of people gave him double candy at the Trunk or Treat tonight since he missed it last year. I noticed tonight as he walked down the sidewalk next to me that he's limping so much less than he was even a month ago. It's been a long, slow road to recovery, but he's getting there. When I think back to how scared of losing him I was a year ago, it's hard to feel anything but grateful for having him with us today. Like many of you, I've spent way too much time on Facebook over the last few months. A few days ago, I was messing with my profile and added an Obama button to my page. Within minutes, one of my ward members had sent me a message, nicely asking me to justify my support. I did, and I think the whole interaction was pretty amicable, but it left me with butterflies in my stomach. Several weeks ago, I ordered an Obama t-shirt. Every day I check my mailbox, half hoping, half dreading to find it there. I'm not sure that I actually have the guts to wear it. It's not that I'm wishy-washy in my support or want to hide it, I'm just not sure I want it plastered across my chest, either. For many years I wasn't all that interested in politics, and then I was uncomfortable about finding myself on the other side of the political spectrum from the other mommies in my playgroup. I'm still reticent to talk about politics. I don't know if I'm just trying to be polite or if I'm avoiding contention or if I'm nervous about not knowing all the details of all of the issues (I'll admit that some of the real issue-based political posts lose me at about the 20th comment). Regardless, I realize that I still have a long way to go before I'm walking door-to-door or organizing rallies. I have a couple of good friends who live near LA. Both of them have said that they lie awake at night worrying about making phone calls or going door-to-door in support of Prop 8. I know I'm a coward, but I have never, ever been happier not to live in California. It doesn't matter where I fall on the side of the issues, the idea of going door to door or making calls would turn me into a massive ball of nerves. This morning I was out running and came up behind a bunch of girls in my ward who have started walking together in the mornings. I've noticed them in the neighborhood before, and I think it's a fantastic thing to do, especially here in Texas where it's possible to walk all winter. When we lived in Minnesota my walking group was both my exercise and my main social outlet and there were many days when I'm quite sure I would have gone crazy without it. I think I did go crazy on lots of those winter days when I couldn't get out with three feet of snow on the ground. So when I approached them from behind this morning, one of them asked, "How much do you usually run?" 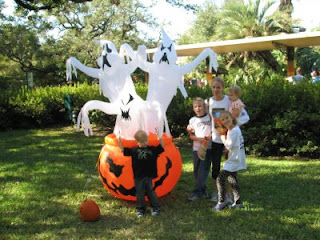 With the five women, the four strollers, the six kids, the dog (was there a dog? ), the cars on the road, and the lack of oxygen to my brain, I was overwhelmed and said something really stupid. "Somewhere between three and twenty miles." The girl responded by saying, "Well, you must think our little effort is pretty pitiful." As I swept on by, I tried to assure her that I thought their effort was great, but I felt feeling like I had just put my foot in my mouth. Technically, yeah, 3-20 miles is what I run on any given day. "Today I'm running six and a half." "My average distance is probably around eight or nine miles." "It depends on how much I have time for." What I should have said, if I'd been thinking clearly, was that for a long time, walking with my stroller for a couple of miles was my best effort. And it was enough. It's taken me years. Years, I tell you, to work up to an eight or nine mile average day (which really means 6-7 miles most days and a longer run once a week). And I never would have gotten here if I hadn't started there. So walk on, my friends! 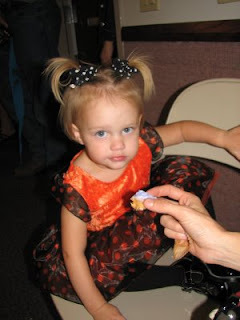 And had lots of fun turning 4! Last week, in the waning miles of the marathon, I had a brainstorm. 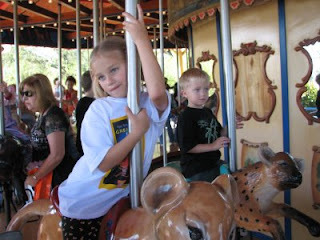 Bryce and Annie aren't so easy. They go to bed at 8 o'clock, which is just about the time that I am DONE for the night. I want to sit down with my feet up and a bowl of ice cream on my lap and some entertaining television show in front of me. I do not want to fight the good fight anymore. But unlike Isaac and Maren, who get in bed and stay there, Bryce and Annie take forever to wind down at night. They go upstairs at 8:00, but it's rare to have them asleep before 9:00. Annie reads, but calls out periodically. Bryce is up and down the stairs ten times a night with questions and requests for another drink. He won't get in his pajamas until we physically force him into them, and resists getting under the covers. So how does this relate to running? 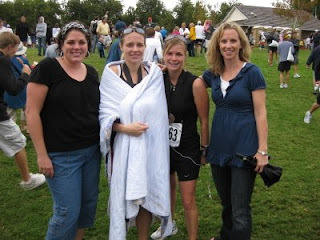 When I first started running marathons, I was totally out of it by the end of the race. I just had nothing left to give. 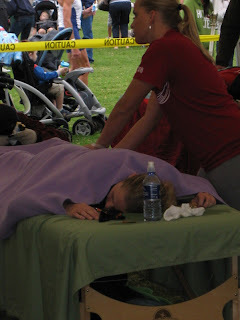 After my first marathon, I staggered to the car and couldn't walk for most of the next week. This time, it wasn't so bad. I was tired when I finished, but after I got a shower, I felt pretty good. The hour from eight to nine feels a little bit like the last couple of miles in a marathon. I'm tired, and I just want to get to the finish line. I just want to have a chance to have a little child-free time before I surrender to sleep. But the last hour is so much more painful if I give up and I'm not engaged and mentally tough. If I sit on the couch with that bowl of ice cream and try to get engrossed in my tv shows, I end up mad every time I get interrupted. But if I go upstairs, sit on my kids' beds, turn off their lights, and help them settle down, I have a sinking suspicion that they'll fall asleep a lot sooner and I'll end up getting to that finish line a little faster. A collection of essays and poems about the process of becoming a mother, and the change of identity that goes along with it. Ok, first of all a disclaimer: The essays and poems in The Mother in Me were written by women associated with the literary magazine Segullah, and as the Assistant Features Editor, I already had lots of respect for the authors. But I have lots more now. In the beginning the women of Segullah made me want to be a better writer. Then they made me want to be a better Christian. Now they're making me want to be a better mother. 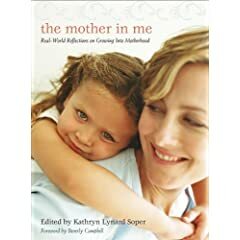 I can't tell you how much I wish someone had put this book in my hands seven years ago, when I had a one-year-old who made me feel like a total failure and I was pregnant and wondering what the heck I was doing bringing another child into the world when I couldn't handle the one I already had. I felt so alone-- I chose to be a SAHM, left a good job and a satisfying academic career in order to do what was best for my kids, and I felt like just about anyone would do a better job of raising this kid than I was doing. I assumed that everyone else had it all together and I was the only one who felt like I couldn't hack it. Now I know I wasn't alone. Every new mom should read this book. Every mom in the trenches should read this book. Every mom who can already breathe a sigh of relief from the intensity of raising babies and preschoolers should read this book (if just to feel grateful that the stage has passed). So basically everyone should read this book. So follow this link (or this one) and buy it. Please. Because one of my essays is going to be included in the upcoming second volume, so I also have a personal stake in hoping this one does well. Occasionally described as the JK Rowling of architecture, Sarah Susanka's books all follow a similar theme-- smaller, exceptionally designed homes with personal details are much more pleasant to live in than impersional McMansions. In the next six or seven months, we'll be going through the process of buying a new home. When we bought our last two houses, our MO was simple-- buy the biggest house we could afford (and it probably still wouldn't be big enough). This time, it's a different situation. We're looking in areas where most of the houses are older and need some remodeling, and we need to resist the urge to buy a house with lots of square footage just because we can. 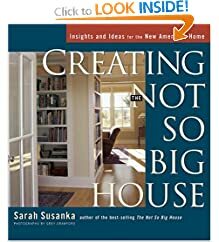 Reading Sarah Susanka's books has helped me open my eyes to the details I need to look for in a home (the flow of the floor-plan or the bones of the house, for example) and has taught me that rooms (just like moms) can be great multitaskers. I had already decided that a formal dining room probably wouldn't get much use by our family, but hadn't realized that a wall of desk space and cabinetry in the playroom could do away with the need for a separate work room for the kids. The books all tend to blend together after a while. I have three more in my reading pile, but I think I'll wait a while before tackling them. Monte Becket, author of a single runaway success and a devoted family man, accompanies his neighbor, former bank robber and wanted man Glendon Hale, on the adventure of a lifetime-- Hale's quest to return to his former wife and make things right. 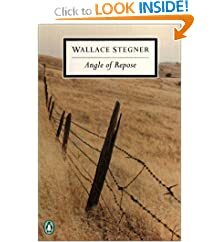 I was a huge fan of Enger's novel Peace Like a River. When I took this book out of the library several months ago, I was almost afraid to read it because I didn't want it to disappoint me. I returned it without reading it, and grabbed it again, when I was in getting my book club picks, just because it called out to me from the shelf. Once I read the first page, I was hooked. 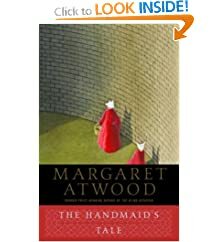 Becket starts the novel with a long lament about how he's such an ordinary sort of guy that his first novel came to him as a surprise and set him up for the bitterness of future defeat. Anyone who has suffered from writer's block or striven to find inspiration can identify with Becket's words. 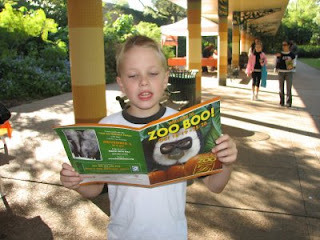 I'm not usually one for stories of boyish adventures, but So Brave, Young and Handsome really touched me. 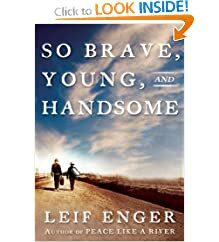 It's a perfect book for an LDS book group or a high school lit class because the subject matter is not objectionable (at all) and, like Enger's previous novel, it's both sweet and thought-provoking. I'm glad I finally picked it up. 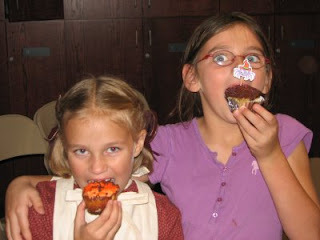 Did someone say they wanted to see pictures? Rebecca returned from St. George and got pictures up! I also paid $20 (gasp!) for a cute one of me at the finish line, and I'll post that once it arrives in the mail. 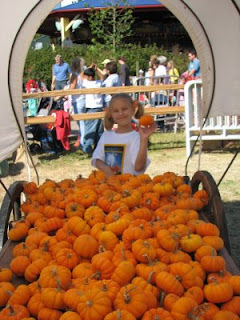 You can kind of see me in this one. I'm the one in the skirt, behind the guy in the black tank top. With Rebecca, who was the best cheerleader a girl could ask for! With Sheree, who I hope doesn't hate me for posting a picture of her with bread in her mouth. She looks adorable anyway, right? Thursday night we had our fantastic book club selection night. We had a great turnout, and by the time the night was over, we had eaten our way through a whole cake and a pan of Ina's Outrageous Brownies. 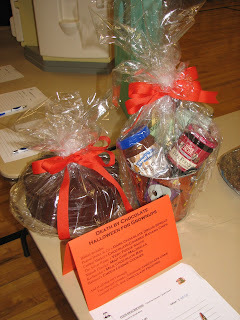 We'd presented our books (over 70 in all) and voted for them, and then when everyone else went home, Lyn and I slogged through the votes and picked our reading lineup for the next year. It's a great lineup and I'll post it in just a little while. But I was so excited after all of the women left that I went to bed late. Very late. Friday morning dawned very early. I got the big kids off to school, the little kids off to my friend Annie's house (thanks, Annie!) and got on the plane. I keep forgetting how relaxing and easy it is to travel all by myself. I read and slept and generally had a nice time. Then I got to Vegas, jumped in the car and drove to St. George. Sheree and I stayed at her husband's grandma's house, and it was so nice to have a quiet place to stay. Once she arrived we picked up our packets and drove the race course. Then we came home and had a pasta dinner (Sheree took great care of me!) and went to bed. Saturday morning dawned even earlier than Friday morning. Let's face it, 4:15 am just isn't morning. It's night. 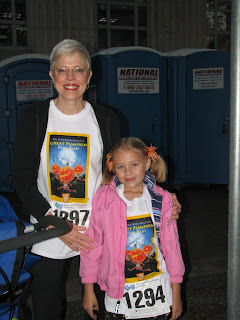 But that's when Sheree and I woke up, got dressed (me in a fancy orange flowered running skirt! ), tossed down some bananas and protein shakes and headed for the buses. We got to the starting line about an hour before the race started. Although it had been sprinkling a little bit down in the valley, it was raining hard 26.2 miles up the canyon. Sheree came through again with space blankets and hand warmers and we spent our time either standing by the fire or waiting in the bathroom lines (usually I spend as little time as possible in the portapotties, but I was happy for my time in them at this race because at least they were dry!). The hour seemed to pass quickly, and pretty soon it was time for the race to start. I found the 3:20 pace group (our leader, Darris, was featured in last month's Runner's World article about pace groups). 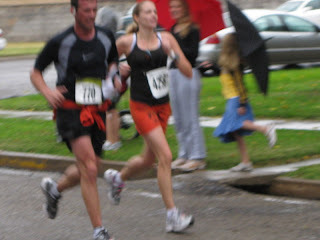 I also hooked up with Bode, my friend Rebecca's brother-in-law, who was shooting for a Boston Qualifying time of 3:15. We decided to run together to see if we could get him to Boston to run with me and Rebecca. When the gun went off, it was dark and wet. Everyone was tossing off their warm clothes and garbage bags and space blankets everywhere. For the first couple miles, it took all of my effort just not to trip. Several people did. 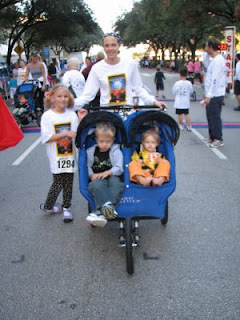 I cast off my warmup pants at the beginning of the race, but kept the t-shirt on until four miles into the race. Really, there's not that much for me to write about the race itself. In the past, I've noticed a lot about the scenery, the runners around me, and the terrain. This time I was in a zone. It finally started to get light right about the time we hit the Veyo Canyon hill (mile seven). It was big, but we took it well. Bode was a great running companion, he reminded me to slow down when we were taking things too fast, but he really pushed me on the flats. Around mile 15, I started to notice the surroundings and said something like, "oh, it's kind of pretty here." Duh, this is one of the most scenic marathons in America. Seriously, though, I could have been on a treadmill for all I noticed it for the first 3/4 of the race. 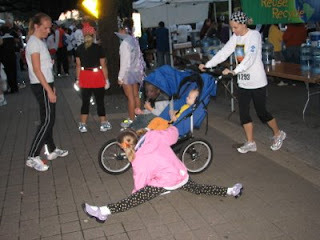 Bode and I stayed together until about mile 17 or 18, when he needed to stretch a cramping muscle. I thought he was going to stretch quickly and catch up again, so I kept going to keep the pace. Unfortunately, I never saw him again. The change I've noticed the most over the course of the three marathons I've run this year is how my stamina has improved. 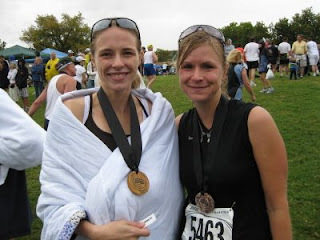 At my first marathon, the whole second half was really hard and the last six miles were agonizing. At the second marathon, I felt good until I had four miles to go, but it took some serious effort (self-talk, praying, visualization, begging) to get me through to the end. Yesterday, I felt great right until I saw a sign that said "seven blocks to go" and realized those were seven freaking long blocks. I got passed by several guys after we rounded the last corner. 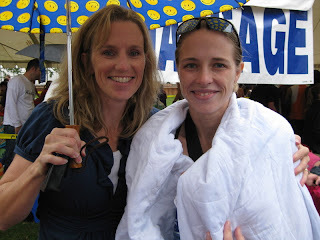 I was excited to see Rebecca about a block from the finish line, cheering me on. Next time, I hope to have enough left in the bank that I can pour it on at the finish! Anyway, I came across the line in 3:16. That's 11 minutes better than my time at Country Music in April, but I've read that people generally do about 5-7 minutes better at St. George than at other races, so my actual improvement is probably somewhere in the 4-6 minute range. I was 12th in my age group and the 50th woman overall. There's a cool stat sheet on the website, and I was stoked to discover that I finished ahead of 89% of the male finishers. Yes, I realize I'm bragging. The finish line was cold. Running for more than 3 hours in the rain (sometimes sprinkling and sometimes stinging, but always raining) finally caught up with me. I started the same kind of uncontrollable shivering that I always get after I have a baby. The ice cream I ate probably didn't help (although it tasted great!). I got a massage (heaven!) and one of Rebecca's daughters gave up her blanket for me. Bode finished at 3:35, and although I felt bad that I hadn't helped him get to Boston, I'm guessing he would have been even more frustrated if we had run all the way to the finish line together and he missed the qualifying time by 45 seconds. I found my friend Cara and her husband, and we all cheered as Sheree came through the finish line. She did a fantastic job and shaved of 45 minutes from her last marathon time! We got back to the house with just enough time for me to shower, toss my stuff in my backpack, and drive to Vegas. I got a pizza from Wolfgang Puck's and some chocolates from Ethel's and reveled in the silence of a solo flight with a whole row to myself. I read a whole book (The Mother in Me, which you should read too!) and got home at 10pm to find three of the four kids still up and waiting for me and Eddie relieved to pass the baton. 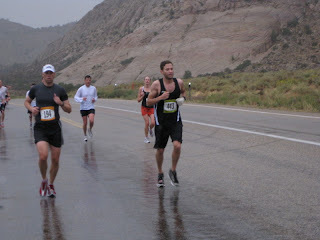 Yesterday was my first St. George Marathon, but I certainly hope it wasn't my last. I was planning to take a several-months break after the race, but I've decided that I don't want to lose my current level of fitness and even if I don't race again until Boston (oh yeah, I qualified for 2010), I'm going to keep up the training. Another advantage is the lack of soreness. I hardly feel sore today! I'll put up some pictures once I can get Rebecca to upload them. I had a Shot Blok in my mouth every single time the race photographers shot pictures (I took them every other mile at even intervals) and I doubt the pro pictures are going to be great if I have pink teeth. I'll probably be on my way to St. George for the marathon. Why does a marathon always seem like such a good idea when I'm signing up in my computer chair and the race is months away? It doesn't seem like such a great idea when it's staring me in the face. Remember when you were a little kid on Christmas Eve? Remember how excited you were? Remember how hard it was to fall asleep? That's how I feel the night before Book Club Selection Night. This year's selection night has been twice postponed-- and when Ike came to town last month, I was so excited to meet for Selection Night that Lyn (my new and enthusiastic and fearless co-leader) and I waited until the very last moment to cancel. We like books more than we fear hurricanes, I guess. But when it became apparent that we would probably be the only two willing to meet that night, we caved to the pressure. My mom and dad listened to this book while on a driving trip this summer, and while I'm used to getting book recommendations from my mom, my dad got on the phone and positively gushed over this one. If you know my dad, it's hard to imagine him gushing, but he did, and over a book about "the social, romantic and sexual tribulations of four young women from the elite classes of Riyadh, Saudi Arabia." If it's chick lit and my dad can get into it, then it must be good. I've heard tons of buzz about The Guernsey Literary and Potato Peel Pie Society. Unfortunately, it's dumb name. It's such a dumb name that I almost feel dumb recommending this book. And it was written by two people. I'm highly skeptical of books written by two authors (in fact, our most hated book club read of last year was a two-author read). But lots of people I know and respect have praised this book to the heavens. I figure that even if it's not great, there will be plenty to talk about. If you know anything about me and my reading proclivities, you know I love reading about India. 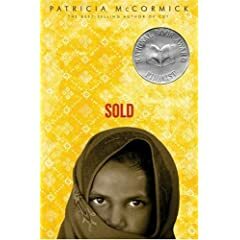 This novel, which won the Booker Prize in 2006, takes place in the mountain ranges of Northern India and New York City. 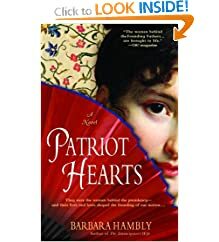 It's apparently a beautifully-written novel, and according to the polarized reviews on Amazon (lots of 5-stars, lots of 1-stars), there will definitely be lots to talk about. I have a feeling that this might be the Three Cups of Tea for our book club this year. 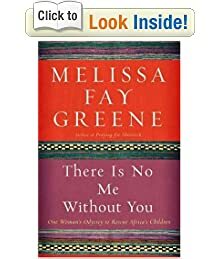 It's the story of Haregewoin Teferra, an Ethiopian woman who began adopting orphans with AIDS and "began in small stages and grew to irrevocably transform her life from that of 'a nice neighborhood lady' to a figure of fame, infamy and ultimate restoration." It looks like not only a good read, but also an important book. I'm breaking my own rule about not recommending books I've already read (after one painful book club year when I'd already read 75% of the books in our lineup), but this one is too good to pass up, and I think it's a great book for a mainly LDS group to read. It's the story of Kate Braestrup, a mom of four young children, whose life was turned upside down when her husband, a Maine State Trooper, is killed while on-duty. She fulfills his lifelong dream of becoming an ordained Unitarian Universalist minister, then takes a job with the Maine Game Wardens, ministering to people whose loved ones have gone missing or been killed. 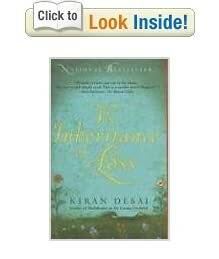 It's a beautiful book about the restorative powers of love. Braestrup gave a fantastic interview about the book with Krista Tippett, and I'd love to incorporate parts of the interview into our discussion.